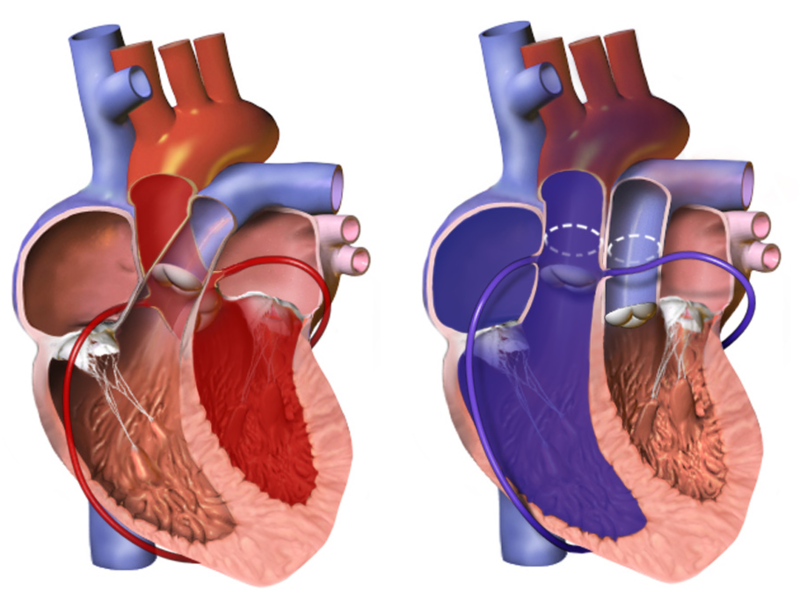 The pulmonary artery – which normally carries blue (deoxygenated) blood from the right ventricle to the lungs. The aorta – which normally carries red (oxygenated) blood from the left ventricle to the body. The anatomical configuration of this anomaly establishes a potentially fatal parallel circulation that results in deep hypoxaemia from lack of mixing, with resulting lactic acidosis and demise. Prompt, adequate preoperative intervention and stabilization, followed by surgical repair and expert postoperative management, favour an excellent outcome. In approximately 60% of the patients, the aorta is anterior and to the right of the pulmonary artery (dextro-transposition of the great arteries [d-TGA]). In approximately one third of patients with transposition of the great arteries, the coronary artery anatomy is abnormal. In dextro-TGA the pulmonary and systemic circulation run in parallel, causing oxygenated blood to recirculate only in the pulmonary circulation and deoxygenated systemic blood to bypass the lungs. This results in cyanosis unless there is mixing of oxygenated blood and deoxygenated blood. In levo-TGA [also called as CC-TGA] the ventricles have switched places as opposed to the arteries and thus this is acyanotic as deoxygenated blood can return from the systemic circulation and enter the pulmonary circulation to be oxygenated before entering the systemic circulation again. Nevertheless, the right ventricle and tricuspid valve is not accustomed to the higher pressures of the left side of the heart and thus, there is hypertrophy over time, which can result in tricuspid regurgitation and heart failure. The exact embryological mechanisms that result in TGA is unknown; however, there are currently two theories that try to explain the phenomenon. Pulse oximetry shows cyanosis and there can be discrepancy between upper and lower limbs. Capillary blood gas may show metabolic acidosis with decreased PaO2. As there is a lack of oxygen going to distal organs, cells respire anaerobically producing lactate. Surgical correction, commonly arterial switch operation [ASO] is usually performed before the age of 4 weeks. Prognosis depends on the complexity of the TGA and how it was surgically repaired. Post-surgical correction, survival is approximately greater than 90% at 20 years. The incidence of sudden cardiac death in repaired TGA patients is reported to be between 0.3% to 0.8%. This is thought to be related to primary arrhythmia. M. Unolt, C. Putotto, L. Silvestri, D. Marino, A. Scarabotti, V. Massaccesi, A. Caiaro, P. Versacci and B. Marino, “Transposition of great arteries: new insights into the,” Frontiers in Paediatrics, vol. 1, pp. 1-7, 2013. Which of the following do you require for dextro-TGA to sustain life? Which of the following is not a risk factor for TGA? A boot shaped heart on CXR may suggest what? What initial management is required to keep a ductus arteriosus patent? What is the most common cause of cyanosis in a new born? Where does mixing of oxygenated and deoxygenated blood commonly occur in TGA to allow sustainable life? What is the acid-base status commonly found in these patients that requires correction?